Click here to check out our latest events! A watershed is defined as an area of land that drains to a common point. That common point may be a lake, an outlet to a river, or any point within a river system. The Big Walnut and Deer Creek Watershed is approximately 271,000 acres and lies mostly within three counties – Boone, Hendricks, and Putnam. 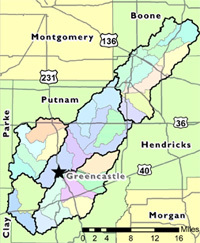 The watershed is dominated by agricultural landuse with the exception of a few towns and the City of Greencastle.